Ideals and philosophies certainly change when one’s position in the world changes. President Obama’s push to “double down” on data mining is disconcerting as well as frightening – particularly since he railed against these very techniques when Bush was president. Our Constitution contains a Bill of Rights – granted it was added in 1791 a couple of centuries before current “invasive” technology was invented – but the concepts contained in its provisions are still worthy of protection. Unfortunately, the Bill of Rights is well on its way to obscurity in the area of the various individual liberties contained in several of its Amendments. Two of the primary amendments that protect citizens against unwarranted and unjustified and unsubstantiated government intrusion are the Fourth Amendment and the Fifth Amendment. The Fifth Amendment clauses against self-incrimination and the requirement of a warrant based on probable clause are becoming increasingly useless in today’s world. The self-incrimination clause provides that one arrested and brought to trial does not have to take the stand to provide testimony against himself or herself. It focuses on oral testimony – not physical evidence. Even the mere mention by the State that the defendant did not take the stand can cause reversible error. But, with the protection of the Fifth amendment limited to oral testimony, States for years have found courts willing to issue warrants that allow the prick of a needle to draw a blood sample, the insertion of a swab to invade the open mouth, or the pluck of a hair uprooted from a head to be used against defendants as evidence in courts of law. Thus, the self-incrimination aspect of the Fifth Amendment is rarely relevant today in criminal trials other than to call indirect attention to the fact that the defendant has decided not to take the stand. The encroachment into the parameters of the Fifth Amendment warrants clause has now made its way into the realm of the Fourth Amendment by little-noticed and much-ignored forays using a secret court that issues secret warrants. The Fourth Amendment protects citizens in their persons, houses, papers, and effects against unreasonable searches and seizures. Yet, one incident – 9/11 – has made the citizens of the United States into suspicious, shivering, anxious masses willing to trade protections found in our original Bill of Rights – those liberties fought for and secured by the giving of the ultimate sacrifice by our Founders – to gain a security that will never be assured. After 9/11, President Bush and his Neocons went to work on Congress establishing an environment of trepidation based on a color-coded “scale of fear” – ups and downs on a regular basis informing the public of the dangers that loomed on the horizon and the image of another “big one.” One of the lesser known or scantly acknowledged “plans” was to reinvigorate a languishing secret court created through the original Foreign Intelligence Services Act of 1978 (FISA). The secret court – the Foreign Intelligence Services Court (FISC) – was established to review requests for warrants to “obtain” information deemed necessary by the federal government to protect its citizens. The application process was set up as one-sided – no one else appears – only the government presents its evidence to support its request for issuance of a warrant. The government literally says this is what it wants and the FISC genuflects and grants the warrant – it is a rubber-stamp court. Of the 20,000 requests submitted to the Court since 2001 – when the Patriot Act reduced the requirements for obtaining a warrant – only 11 applications have been rejected. Similarly, the court allowed the FBI to issue more than 140,000 National Security Letters since 2004. This, then, is the judicial body into which Americans have placed their blinding trust – a court that lacks the spine to thoroughly review and make a rational decision as to issuance of its secret warrants – a court willing to rubber-stamp secret warrants because it cowers at the thought of an incident in which it failed to issue a request. Americans have become so frightened of another attack – which will most assuredly happen given time regardless of efforts to stop it as was evident in Boston – that they are willing to sacrifice their most cherished liberties. Unfortunately, as Benjamin Franklin understood, giving up our liberties to obtain security demeans the very work that our Foremothers and Forefathers undertook to give us an open society – not a society based on secrecy and totalitarian methods. Republicans have, once again, framed an issue to suit their own misguided – and downright false – interpretation of our Constitution. The original body of our U.S. Constitution contains scant mention of religion. One prohibition is the requirement of a “religious Oath” for the purposes of holding office at the federal level – keep in mind the Constitution was a guideline for the relationship between federal authority and state authority. In just one short sentence, the Founders created the potential for some of this country’s biggest social and legal battles. Yet, the first amendment references the prohibition against establishing a religion first – before providing the free exercise of religion. The fact that both of these appear before any other right – including freedom of speech and the right to bear arms – demonstrates the paramount importance that the Founders placed on the role of religion – or lack thereof – in the new Nation. Republicans would have everyone believe – incorrectly – that religious freedom is absolute and that government cannot interfere with what they might consider a realm of religious freedom. But the reality is that, while beliefs are inviolate, when religion turns those beliefs into actions, those actions can be regulated by law. States consistently make laws that interfere with the “free exercise of religion.” Members of certain denominations cannot handle poisonous snakes even though it is seen as a display of faith and trust in God. Native Americans are not free to use peyote in their ceremonies without consequences. Parents whose child dies due to withholding life-saving medication based on a belief that prayer will heal may be held criminally responsible for that child’s death. Thus, to say that religious freedom trumps is false – no right in the Bill of Rights is absolute. Laws exist on many levels that govern religious freedom, yet Republicans would have the public shudder in fear that our “collective” religious freedom is on the verge of collapse because those who work for religious institutions must provide birth control. If anything is absolute at all, it is the unabsoluteness of freedom of religion, regardless of the gnashing of Republican teeth and the desire to substitute a Bayer Aspirin for that little round packet of protection. 3) the memorial to slain civil rights workers created by Maya Lin and located in Montgomery, Alabama, at the Southern Poverty Law Center. I planned my stops to visit Birmingham first, then Selma, then Montgomery, the Alabama state capital. 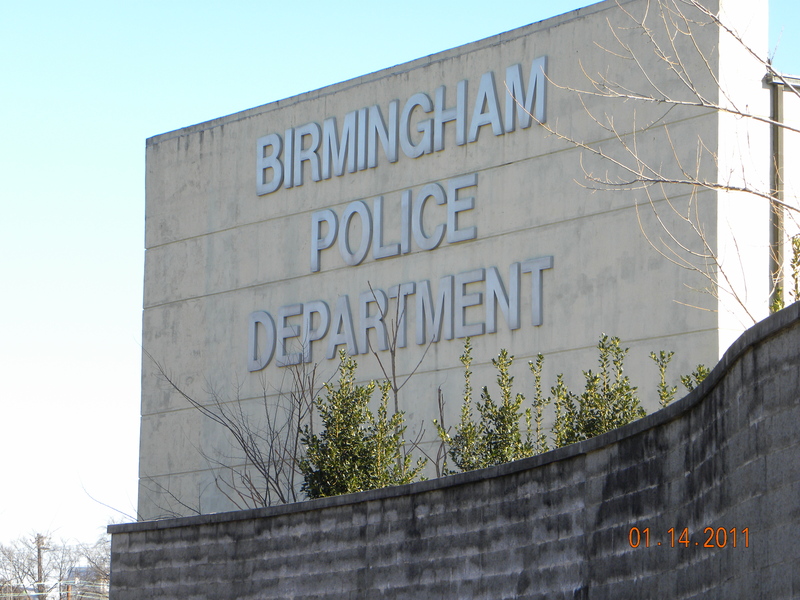 The Birmingham jail was a modern building, and, from the looks of it, I am sure it was not the original building where Martin Luther King, Jr. spent his time. A police officer assured me it was the location but not the original jail. He graciously took me on a short tour and opened a locked courtroom so I could see where the alleged defendants appear and plead. I found myself wondering how one pleads when the “crime” is asking for recognition of basic human dignities and respect. 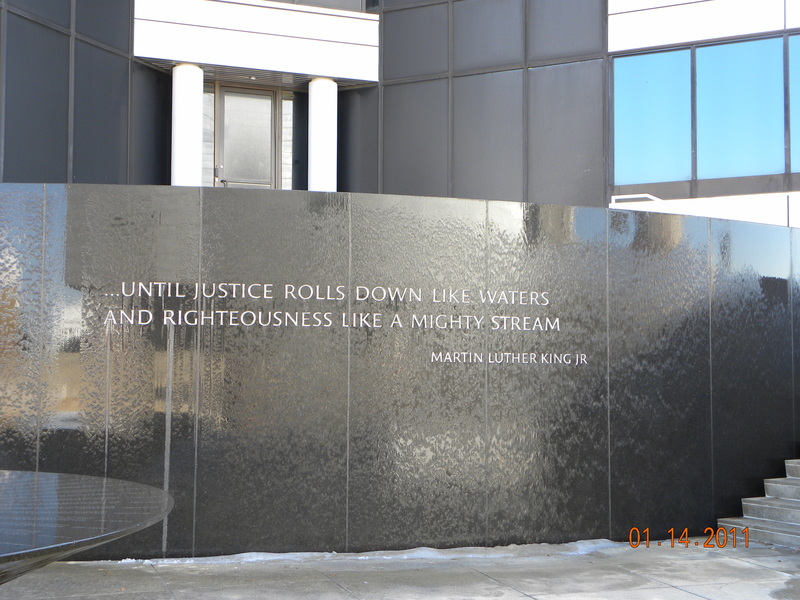 Birmingham has several other civil rights sights, but I did not have time to see them – so, next time. I left the jail a little disappointed but understanding that time moves on and buildings such as jails seldom withstand that march of time. I had envisioned, unrealistically, that I would somehow actually see the dark, gloomy cell with its small window where Dr. King sat and wrote by the fading daylight. I got into my truck and headed for Selma. My one son had given me a plug-in GPS that he no longer needed, and I had been using it on the trip. I found myself getting quite annoyed at the voice challenging me with the worn-out phrase “recalculating.” I knew darn well where I was going, and I didn’t need the mouthy GPS to tell me differently – although I have to give it credit for some of its advice. The route to Selma took me through the Alabama countryside along peaceful and tranquil back roads. The terrain was hilly with picturesque hollows and ridges. As I drove along at an easy clip, I found myself thinking about the ugliness of dragging blacks out to deserted areas, beating them savagely, and then hanging them – their lifeless, bloodied bodies the remnants of their only “crime” – to be born black . I pictured the Klan meeting down in a hollow, long flowing white robes with hoods covering faces, fires burning in the night, and hate spewing from lips. As I approached Selma, I saw signs noting that the Edmund Pettus Bridge was not far away, but the signs had no indication of the Bridge’s role in civil rights history. Perhaps the lack of acknowledgment was intentional. Why would city residents remind visitors of their hometown’s role in one of the bloodier moments of civil rights history? 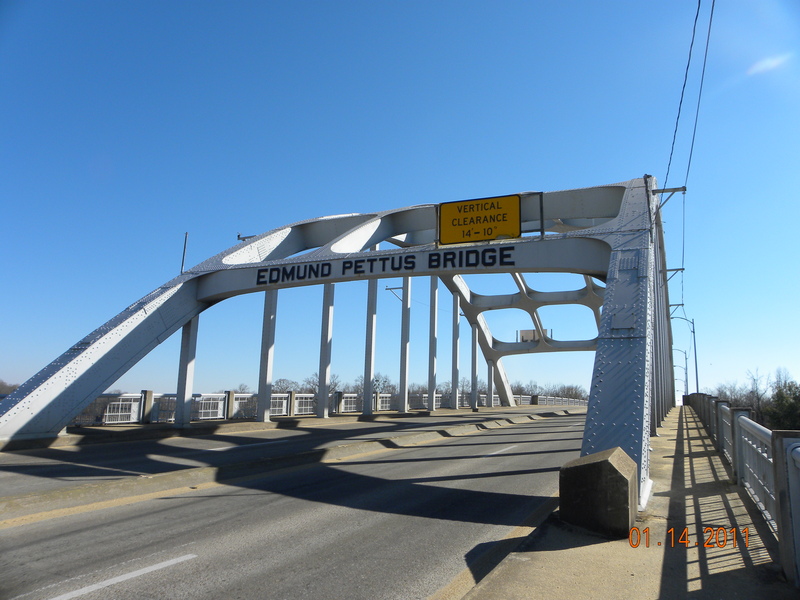 Selma’s main street – Route 80 – leads right to the Edmund Pettus Bridge – it cannot be missed. 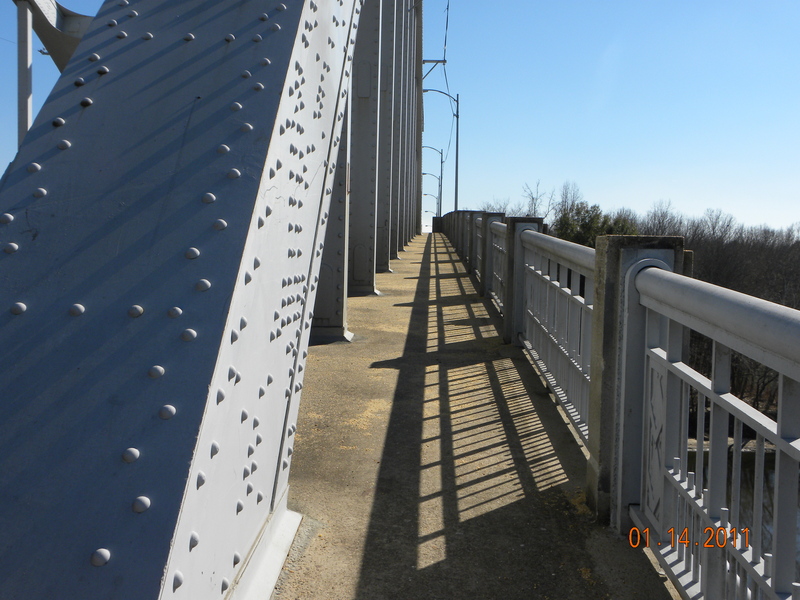 As I headed down main street, the bridge loomed in front of me, an arch bridge of grayish hue spanning the Alabama River as it flows through Selma. I parked along a side street with brick sidewalks and walked to the bridge. The sun was bright with no clouds in the sky, but it was January, and it was cold. As we anticipate an event, sometimes we are disappointed. I was not disappointed in the bridge. Now close to 46 years ago, the Bloody Sunday march began on March 7, 1965, and became a powerful symbol of the civil rights struggle in the south. The march was organized to protest the killing of a protester who had been fatally shot by an Alabama state trooper. Six hundred marchers assembled in Selma on that Sunday in 1965 and, led by the groups, Student Nonviolent Coordinating Committee (SNCC) and Southern Christian Leadership Conference (SCLC), crossed the Edmund Pettus Bridge over the Alabama River en route to Montgomery. Just short of the bridge, they found their way blocked by Alabama State troopers and local police who ordered them to turn around. When the protesters refused, the officers shot teargas and waded into the crowd, beating the nonviolent protesters with billy clubs and ultimately hospitalizing over fifty people. As I walked slowly along, I visualized the hundreds of people lined up on the bridge, jostling and waiting to start their trek over the bridge. I tried to imagine the chaos as the police blocked their path, determined not to allow them across the bridge to disturb the quiet of a Selma Sunday. I tried to visualize the first tear gas thrown and the first blow of the billy club. 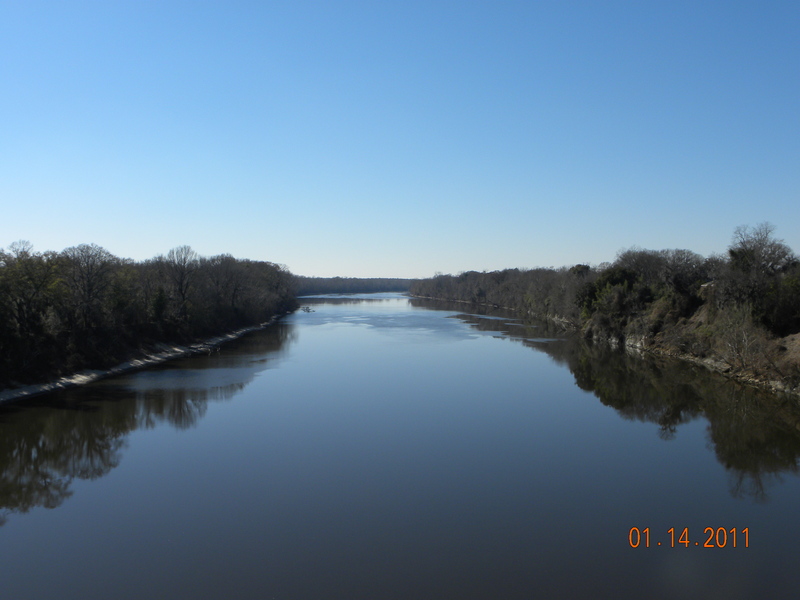 I really wanted to linger much longer in the bright yet cold January sun – gazing out on the Alabama River and just thinking about the struggles that occurred simply so a people could be free. But I had to move on to Montgomery to my third goal – the Maya Lin memorial at the Southern Poverty Law Center. My last stop was Montgomery and the Southern Poverty Law Center (SPLC) with its huge black granite civil rights memorial created by Maya Lin, who also designed the Vietnam Wall. 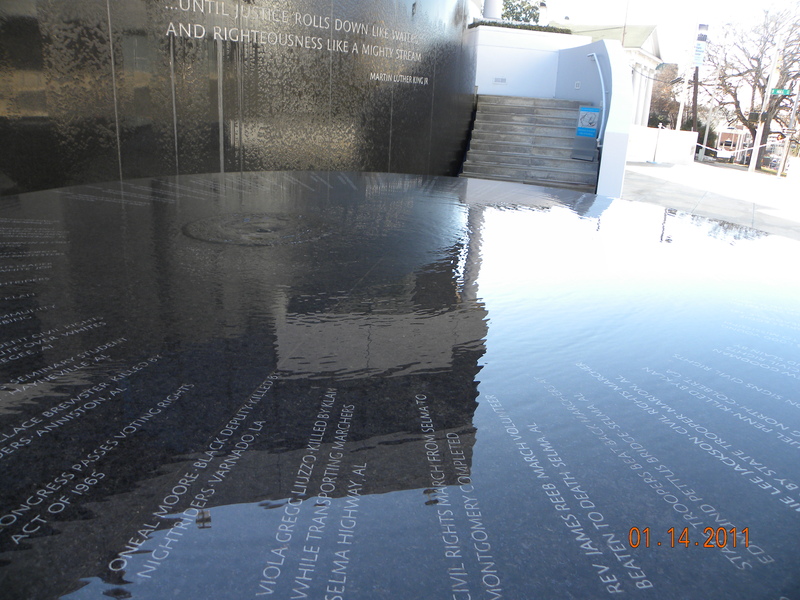 The memorial was commissioned to honor those who died during the struggle for civil rights. Montgomery is built on hills, and I had a bit of a time finding the Center – parking spaces were also at a premium. I finally found a parking place and set out for the memorial, which was about a block away. The memorial is set out in front of the Center’s offices in a recessed area, and, as I approached it, I noticed there were chains across the two openings with signs warning of ice. The chains were to keep visitors away from the area where the water had splashed onto the ground and frozen. I did not see much ice on the ground. Come on, I thought, I am from the land of the frozen north – a little ice is nothing. And, let’s face it; I had driven almost 700 miles to get up close to this memorial, and I was not about to stand ten feet away, content with just looking and not touching. I took a few pictures from a distance – trying to decide whether or not I wanted to take a chance and move the chain on one side and enter into the “danger” zone. My desire to stand by the granite table and actually put my hand in the water as it flowed over the sides got the best of me. I looked around, and, seeing no one, I moved the chain back and slid into the area, replacing the chain. The memorial was only three or so feet away, and I walked up to it – I couldn’t believe I was here after reading about the memorial and seeing a documentary about Maya Lin. I took a couple of pictures and then placed my hand on the top of the table to feel the cold water. I placed my hand in the cold water and understood – this was a remembrance of history all gathered in one place on a black granite memorial. A memorial to make us think and remember. I wasn’t at these momentous happenings but as I was tracing a pattern in the water and reading the dates of important civil rights events, I felt a connection to that part of our history. I was deep in thought when I heard someone say, “Excuse me.” I looked toward the building and didn’t see anyone, but I heard the voice again. I turned around, and a security officer was standing on the sidewalk. He told me what I already knew – that I wasn’t supposed to be in that area. I apologized profusely and told him I had gotten several pictures. I would leave – not that I had a choice. I told him I had driven almost 700 miles, and I just wanted to touch the memorial and place my hand in the water. He was very kind and polite but firm. In a somber mood, I exited the memorial and walked back to my truck to head on my way to Florida and another new and exciting experience – while not of historical import – of an air boat ride on Arbuckle Creek and Lake Istokpoga. I recently took a short trip to Florida and ran smack dab into the body scanner issue at our little, ole airport. Now, I am not sure what basis is used to establish the need for these things, but Fort Wayne is no Chicago, New York, LA, or any other huge city- although we are now the 71st largest city in the United States. I had made up my mind quite some time ago – when I first learned of the invasion of the body scanner – that if I flew, I would not go through it. I got my chance to refuse the scan this past month. After I removed my shoes and put them along with my tote in a plastic bin, I told the security officer I didn’t want the body scan and would submit to the full body pat down instead. Ah, but the next part was really good. I was informed that the full body pat down would be done in front of everyone – the security personnel and other passengers going through. I looked at her and said okay – perhaps it was a tactic to intimidate me, but it didn’t work. She did the full body pat-down in front of men and women alike. So much for any modicum of privacy. I made it through and sat down to put my shoes back on and headed on my way. The rest of my flight to Florida was uneventful with the exception of a few bumps. I enjoyed my three days immensely, and, I knew for my return trip it wouldn’t be an issue because Tampa-St. Pete doesn’t have a scanner – yet. However, when I went to check in at the Tampa-St. Pete airport, the clerk pulled up my info for boarding, took my driver’s license, and disappeared into the back for about 10 minutes. I actually started thinking I was not going to be allowed on the return flight. He finally returned, assigned my seating, and handed my license back with no indication as to why he took it into the back room. I will bet you that my name is now on a list somewhere for not going through the body scan. I am ten times – maybe a 100 times more offended by invasion of privacy issues occurring than an insurance company being told it cannot discriminate against me because of a pre-existing condition. Yet, the Republicans continue to moan and cry about our march toward socialism all the while ignoring our privacy rights that have slowly fallen by the wayside since 9/11. I believe that the liberties we are giving up to obtain security – just like Benjamin Franklin – entitle us to neither. I read where 98% of people go through the scanner – only 2% opt-out. Apparently, the increased invasion of privacy at the Fort Wayne airport appears to have gone pretty much unnoticed. Eight years after 9/11, the public is still surrendering to fear and willing to sacrifice “essential liberty” for a little bit of security. Promulgated under the guise of protecting unsuspecting Hoosiers from identity theft, new Indiana BMV rules, which demand an expanded array of goodies to prove identity, will go into effect this January 1st. The rules are a result of the “Real ID Act of 2005” when Congress, under the constant harping and fear-mongering of the Bush administration, implemented the Act to help ferret out terrorists hiding under our beds. The Act, at that time, established a deadline of May 11, 2008, for all 50 states to come into compliance with its mandates. And, all 50 states filed for an extension of that deadline and were given until December 31, 2009, to comply. Interestingly, as of 2009, 23 states have passed resolutions in opposition to the Act, and, Janet Napolitano, Obama’s head of Homeland Security, is a harsh critic of the Act. either their original Social Security card or a W-2 tax form. Even those who follow the new rules will go home without a new card. Instead, state computers will check the info and photo and if there are no problems a card will be sent in the mail – a background check to get your driver’s license. How ridiculous. Your identity can’t be established with all the documents you are required to bring in? You need a background check? The states that have opted for a “no-participation” resolution are perfectly free to do so; however, the federal government will make sure the citizens of those states are duly punished by refusing to allow them air travel, entrance into federal buildings, etc. Indiana has already implemented a facial recognition system where applicants for new licenses or renewals must remove hats and glasses and not smile when having their photos taken. Hair must be drawn back away from the face. Must be that BMV employees can no longer be trusted with the earth-shattering mission of comparing the human face in front of them with the picture on the driver’s license. Remind anyone of Orwell’s prophetic novel “1984?” The Real ID Act of 2005 is nothing more than a march toward a national identification system which Congress has deceptively labeled as necessary to protect us from terrorism. Indiana has decpetively labled it as necessary to protect us from identity theft. When it comes to getting the government out of our lives, the anti-choice crowd exercises a double standard. Senate Bill 417 introduced by Senator Jean Leising of Indianapolis mandates a woman considering an abortion shall obtain an ultrasound at least 18 hours before the abortion. To top it off, the woman would be responsible for the cost of the ultrasound. The statute being amended already provided an option for the woman if she wanted to have an ultrasound. Apparently, allowing the woman a choice just doesn’t sit well with the anti-choice crowd. Of course this goes hand in hand with the notion that women aren’t capable of making a decision with their doctors about whether or not to have an abortion in the first place. Ultrasound before an abortion. Requires that at least 18 hours before an abortion that a pregnant woman seeking an abortion must obtain fetal ultrasound imaging, hear the auscultation of the fetal heart tone if audible, and view and receive a copy of the fetal ultrasound imaging. Specifies that the pregnant woman is responsible for the cost of the fetal ultrasound imaging. What will they think of next? Well, here is another bill that has been introduced. Adoption of abandoned embryo. Allows an abandoned embryo to be adopted for implantation by another individual under specified circumstances. States that a person who knowingly or intentionally destroys or discards an abandoned human embryo commits unlawful destruction of an embryo, a Class A misdemeanor. Honest to pete, how will the anti-choice crowd enforce these invasive tactics? Will they be camped outside the women’s clinics demanding to see the ultrasound image when the women exit the clinic? Will they visit fertility clinics to ensure that the embryos are kept safe until the adoptive parents arrive? Does a termination of parental rights hearing need to be held to sever the ties between the biological parents of the embryo and the embryo? Enough is enough. The sad thing is that while many in the anti-choice movement chafe and rant against government interference, they turn around and haul in the government whenever they deem necessary to suit their own purposes, and they don’t even see the double standard created by their actions. The Indiana Senate and House are again poised for a tussle over an anti-choice bill that would require doctors who perform abortions to have admitting privileges at a local hospital in the county in which the abortion is performed. SB89 has been around the block before and has failed to pass muster. Remember this is the same legislation that Allen County anti-choicers couldn’t quite manipulate by the Allen County Commissioners. The Commissioners soon realized that the bill that they were presented this past year was simply a pretext to curtail access to abortions by requiring that the doctor have admitting privileges at a local hospital. The regulation presented to the Commissioners was gussied up to look like the proponents really cared about those who were having out-patient procedures. Trouble was, on a closer review of the regulation, it was discovered that the only procedures that were covered were those typically associated with first trimester abortions. Nary a provision was included that protected men from a failed out-patient procedure by doctors. Now, I have to ask – is Ms. Humbarger actually suggesting that if a woman appeared at an emergency room at midnight in dire circumstances that the personnel would blow off the Hypocratic Oath and turn her away? Nah – she surely couldn’t be suggesting that someone with a life-threatening emergency would be shunned and left to stand at the sliding doors of the emergency room. Senate Bill 89 is simply another step in the direction of ultimately curtailing a woman’s choice. Perhaps Ms. Hunbarger and those concerned with the incidence of abortion should focus on educating people about how to prevent pregnancies in the first place. The United States Supreme Court on Monday decided that judges may use discretion in imposing sentences in federal drug cases. In Kimbrough v. United States, ___ U.S. ___ (2007), the Supreme Court fell in step with the U.S. Sentencing Commission which earlier this year adopted guidelines that subtantially lessen the disparity between sentences for powedered cocaine and crack cocaine. Federal sentencing guidelines imposed the same sentence for a crack dealer as for someone selling 100 times as much powder cocaine. African-Americans were nearly 82 percent of defendants sentenced in federal court for dealing crack, but only 27 percent of those sentenced for dealing powder cocaine, according to 2006 federal statistics. The disparity had been challenged by civil rights groups because crack cocaine is most often used by blacks, while powder coacaine is most often used by whites. The Court avoided the issue racial disparity by finding that the guidelines were not mandatory but rather “advisory” in nature. The Court’s decision is seen as a major victory for defendants as well as federal district judges who can now use discretion in sentencing now that the guidelines have been found to be advisory rather than mandatory. The sentencing commission is scheduled to vote Tuesday on whether to make those guidelines retroactive for prisoners convicted in the past of crack dealing. If the guidelines are retroactive, almost 20,000 inmates could be eligible for shorter sentences under the proposed changes. Mark Souder has become a crusader for biometrics identification (ID) cards; however, he admits the political climate is not yet ripe. That statement alone indicates he must think sometime in the future it will be ripe. Biometrics is, generally, the study of measurable biological characteristics. In computer security, biometrics refers to authentication techniques that rely on measurable physical characteristics that can be automatically checked. We are already seeing biometrics in everyday life. For example, the fingerprint requirement at banks for “non-customers” as well as at some larger stores for check cashing purposes. 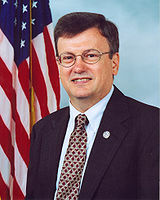 Souder has taken up the biometric cause from his spot as the top GOP member on the House Homeland Security Border, Maritime and Global Counterterrorism Subcommittee. Our Third district is also home to a facility owned by Beaverton, Oregon-based Digimarc Corporation, a producer of 32 states’ drivers licenses, including some with biometric information. According to Tien, a major reason biometric technologies do well in labs but perform poorly when implemented is because lab tests haven’t sufficiently simulated people trying to defeat the system. All the while, Tien argues, citizens would pay a steep toll in terms of personal privacy if they had to submit biometric identifiers. Supporters of increased use of biometrics argue that that is precisely the point — being able to identify, track and monitor bad actors so you know who they are and where they are is essential for national security. But who is bad? And how many non-bad “actors” will get swept into the system? And, aside from the increased security, there would be practical effects that would improve people’s lives, supporters say. For example, passengers who are commonly confused with someone listed on the no-fly list could clear the matter up in a few short minutes if they are carrying a biometrically enabled ID card and airport security personnel are equipped with a reader that can verify or disprove a match. • Immigration and Customs Enforcement could go into American companies and accurately ensure that they are not employing illegal residents. • Customs and Border Protection could accurately identify people attempting to enter the country via a land or sea port of entry. • State and local police could identify potential threats when they are enforcing traffic and other domestic laws. • Bank tellers could ensure that legitimate people are the ones removing or adding money to an account. Souder is considering drafting a bill that would give financial incentives or direct funding to states that include biometrics when implementing the Real ID Act (PL 109-13). Remember, that is the 2005 law requiring states to comply with minimum security standards for issuing driver’s licenses or identification cards or risk having those IDs cease to be accepted for boarding flights or entering federal buildings. Souder says he is taking a “patient approach”, assuming time and circumstance are on his side. Let’s prove him wrong. Keep your eyes peeled on this issue – pardon the pun – because I can assure you, given the Bush administration’s rule by fiat and secrecy, we will see it pushed, and it sounds like Mark Souder is in the forefront of that push. Let’s hope the American people never let themselves be cowed into accepting a national ID card in the form of biometrics. At some point, enough is enough.